This was my first holiday on the bike together with Pieltje. 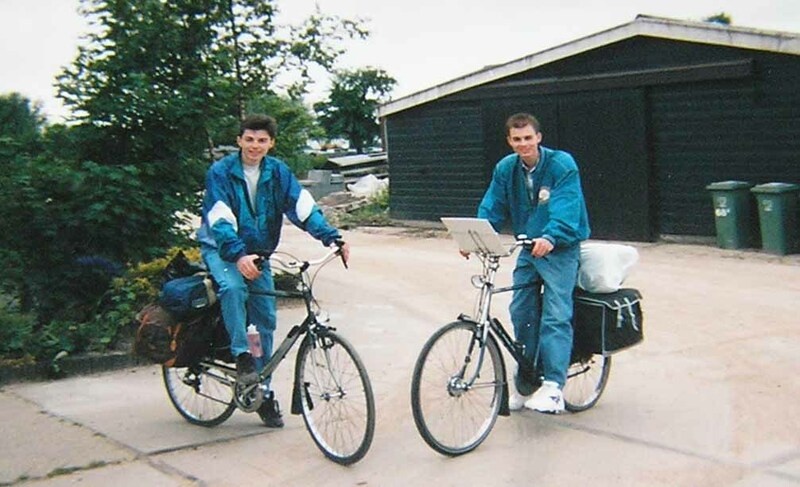 We liked to explore our one country, there we had not alot money we choose to go by bike. It was a good choice, we had a great time. We started in the centre of the Netherlands. The first day we cycled to the North Sea were we camped in Duinerell. From there we went north and we cycled along the coast through the dunes (very nice). Two days later we went over the afsluitdijk, thats a dike which seperates the Ijselmeer with the Zuiderzee. It is one of the mayor protection structures against flooding. In the Friesland one of the two most northly provinces it was very hot at that time. There Friesland is very flat and without trees we sheltered in a Bus stop during lunch to get out the sun. From there we cycled south to teuge where we stayed one week on a parking lot with our tent. There we followed a parachute jumping course and made our parents a bit nervouse.